How can a 100FN4042 be controlled? 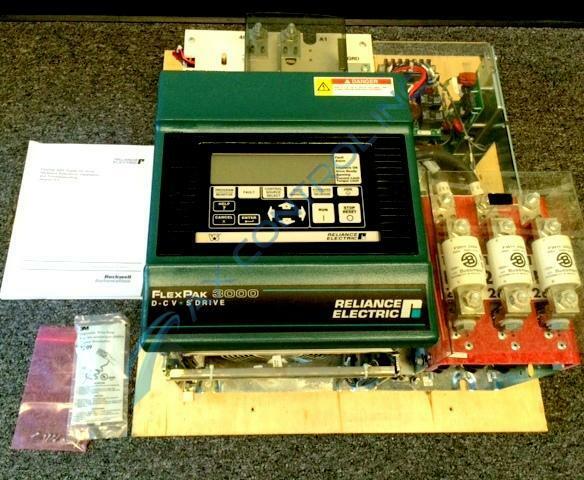 A FlexPak 3000 100FN4042 drive can be controlled locally by the Operator Interface Module, or remotely using the terminals at the Regulator board terminal strip on the 100FN4042 or by the CS3000 software or a network kit. What are the operating states of a Reliance Electric FlexPak 3000 100FN4042? When the 100FN4042 is powered, the 100FN4042 drive is operating in run mode, jog mode, or armature not active. The 100FN4042 is in run mode if it was turned on by the RUN input. What does the analog auto zero adjustment parameter do on a 100FN4042? The analog auto zero adjustment parameter on a 100FN4042, parameter P.102, removes any offset from the analog auto reference signal on the 100FN4042. It is a tunable parameter and the parameter has a range of -200 to 200 on the 100FN4042. Is there a manual for the 100FN4042? We are happy to send you a link to the FlexPak 3000 Digital DC Drive Software Reference Manual. Instruction Manual D2-3405-02. 100FN4042 is a base 460 VAC drive that is manufactured by Reliance Electric as part of their FlexPak 3000 series. Using the conversion kit model number 916FK0200, this drive can be converted into the equivalent 230 VAC drive model number 50FN20xx. This non-regenerative drive has a rated horsepower of 100 HP. The drive can be identified by its model number. The first two or three numbers are the horsepower rating for the drive unless the horsepower is 1000 HP and over. The “F” that follows means that the part belongs to the FlexPak 3000 product line. The letter that follows may be “R” for regenerative drives under 1000 HP, “N” for non-regenerative drives under 1000 HP, “S” for regenerative drives 1000 HP and over, “T” for non-regenerative drives 1000 HP and over, or “K” for kits. The number that follows may be “2” for 230 volts, “4” for 46 volts, or “7” for an integrator. The next number may be “0” for a chassis, “1” for a NEMA 1 enclosure, “2” for a NEMA 12 enclosure, or “7” for an integrator. The second to last number/letter is the version and will be 0-9 or A-Z. The last number may be “1” for U/L and U/L-C listed, or “0” for no listing. The FlexPak 3000 drive is a wireless construction and uses a keypad (OIM- Operator Interface Module) for drive setup using parameter adjustments and unit selection, monitoring and diagnostics. Multiple language capabilities in English, French, German, Spanish, Italian, and “Code” is available. The drive can be controlled locally by the OIM (keypad) or remotely by using terminals at the Control Terminal Block (CTB).